Solenophora species are terrestrial herbs which form somewhat woody shrubs or weak trees. The corolla is large and showy, the tube is elongated, yellow to orange or reddish orange, and the limb has broad rounded lobes, often spotted. 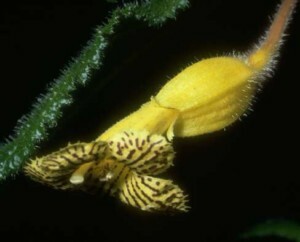 The approximately 16 species in the genus are distributed in Central America and occur in damp forests often at stream-side, at mid and high elevations. It is not known to produce scaly rhizomes, making it unusual in the Gloxiniinae.